Queen size brass metal bed frame has brackets for both a headboard and footboard, both are required to complete the frame. 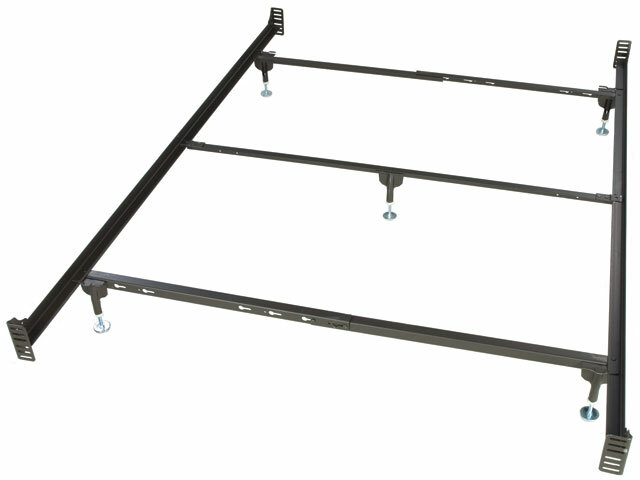 This frames features a rigid center support to provide maximum strength and distribute weight. Sturdy angle iron side rails and cross arms automatically adjust to correct Queen size. This frame uses adjustable floor guides instead of wheels. The bolts for the headboard and footboard are not included because different headboards and footboards take different size bolts. No tools needed for assembly. Queen size brass bed frame with iron rails. Comes with adjustable floor guides.